Did you know today is Park[ing] Day? As it turns out, it is! Park[ing] Day originated in 2005 when Rebar, a San Francisco based art and design collective, transformed a metered parking spot into a park-for-a-day in an effort to make a public comment on the lack of quality open space in American cities. Their goal was to reprogram the urban surface by reclaiming streets for people to rest, relax and play and their mission is to promote creativity, civic engagement, critical thinking, unscripted social interactions, generosity and play. Since then, Park[ing] Day has gone global and the messages are as varied as the participants. From bike corrals, reading rooms, gardening centers, workout spaces, the transformation of a parking spot for cars into something greater is only limited by the imagination. Now every 3rd Friday in September has been adopted around the globe as Park[ing] Day. In 2011 975 parks were created in 162 Cities in 35 Countries on 6 Continents! You may see Park[ing] day in action in the OC at the corner of Chapman and Pomona in Fullerton. They will be promoting concepts in sustainability, water use in the garden, and bicycle safety! If you see Darren, tell him we sad “hi”. Great coverage of the history and current outlook at SFStreets. Bicyclists in Fullerton and north Orange County have been having a run of good news recently. First , the Puente Bike Path opened as reported in the last issue of the Observer. 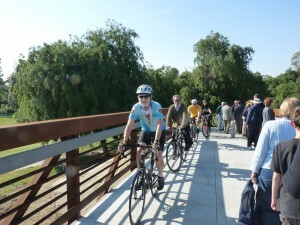 Cyclists and pedestrians celebrate at the ribbon cutting for the bridge over Puente creek. 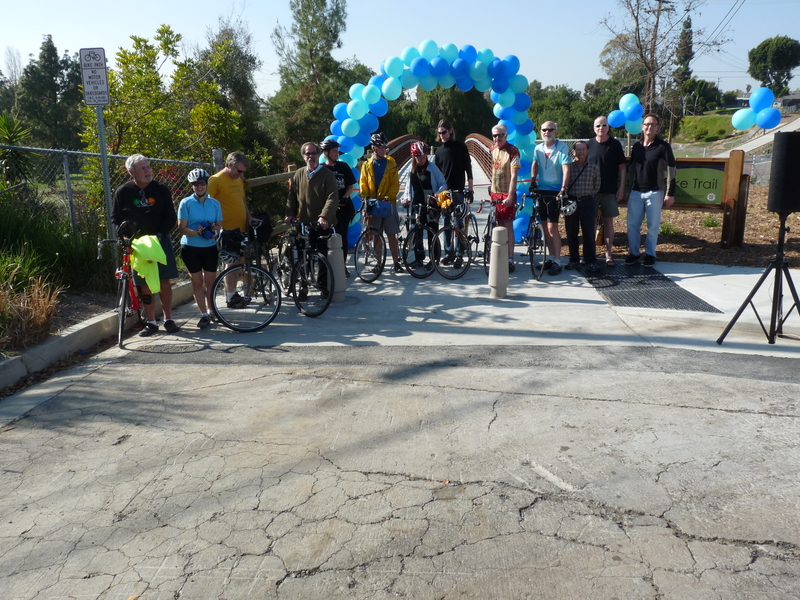 This link provides a safe bicycling route from northern Fullerton and La Habra south into central and eastern Fullerton. Three Council members showed up for the ribbon cutting, including Don Bankhead who had voted against the project. Don acknowledged that the City had done a nice job in building the bridge and path. Also present were Pam Keller who had supported the project when she was on the Council; and two Council candidates, both on bicycles. City councilmembers, eager cyclists and pedestrians attended the opening of the Puente bridge March 20.
pushed they had resisted. The Strategy not only identifies routes but ranks them and gives them priority in OCTA funding. As a result, in the next few years we should start seeing more and more useful bicycle routes in the area. A third item is that Fullerton has been designated by OCTA as the priority site for a bike-sharing program. This is a program — already in existence in many American and European cities — were riders can pick up a bike at one bike station and drop it off at another. It will be particularly useful for getting between the depot and the University and Fullerton College. There will be 10 stations through the city with 15 bike each in the beginning. Fourth ( and fifth and sixth), the Council passed three items on March 20th, all of which have strong positive implications for bicycle riders. First, in discussing hiring a new design consultant for the State College grade separation at the BNSF tracks, if was promised by staff and the new engineer ( from Mark Thomas and Company) that room for a safe bicycle riding would be provided in the undercrossing. This had not been promised before. (I would be even more enthusiastic were it not for the fact that this company did not provide the same for the Placentia Avenue grade separation which it also designed). Finally, the Council approved seeking grants to build a “bike boulevard” on Wilshire between Lemon and Acacia. This route is an important part of a high priority route in the Fourth District Plan and is key to the success of the bike share program. Somewhat misleadingly named, bike boulevards provide safe, comfortable routes for bicycle riding by using a variety of traffic-calming measure to reduce the volume and speed of cars on residential streets. They benefit not only bicyclists but residents and pedestrians as well, largely by taking traffic off of residential streets and putting it on arterials, in this case Chapman and Commonwealth. Perhaps even more important than all of the above actions is what it represents: a sea change in the thinking of planners , engineers and other policy makers from the days when the principal — perhaps the sole — goal was to get cars from Point A to Point B in the shortest amount of time. (The first “Purpose” listed in the Transportation Element of the 1980 Fullerton General Plan was to ” Reduce vehicular travel times between selected origin-destination points.”). Now serious effort is being made at all levels in OCTA and Fullerton and other cities to address the needs of bicyclists and to make our streets safer for bicycling and thus make bicycle commuting and recreation a real option. There is still a long way to go, but we have seen the first steps.